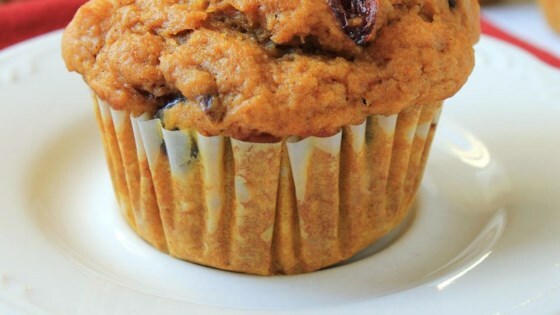 "These yummy pumpkin muffins are perfect for the Thanksgiving table! Substitute toasted pumpkin seeds or dried cherries for the cranberries, if you wish." Preheat oven to 400 degrees F (200 degrees C). Grease or place paper muffin cups in a 12 cup muffin tin. Mix the flour, brown sugar, baking powder, baking soda, salt, cinnamon, ginger, cloves, and nutmeg together in a mixing bowl. Beat the canned pumpkin, eggs, butter, buttermilk, and vanilla together in another large mixing bowl. Gradually beat in the flour mixture until well blended. Stir in the dried cranberries until evenly blended. Spoon batter into muffin tins about 3/4 full. Bake in preheated oven until a toothpick inserted in the middle of a muffin comes out clean, 20 to 25 minutes. 3 minutes before turning out from pan. Serve warm or at room temperature. These moist muffins are bursting with spice and pumpkin flavor. this recipe is a 5 star plus. Not sure why the size of the can of pumpkin would matter because the recipe says I CUP OF CANNED PUMPKIN!! GREAT RECIPE, THANKS! I made these and they turned out horrible. It was like rubber. It would've been helpful you had given the exact ounces of pumpkin puree I needed, instead of just "1 can." Can sizes vary. Tasted great! I used a mini muffin tin instead of the standard sized one, and got 36 muffins out of the recipe. Baking time was 15 minutes. Awesome! I used mini-loaf pans for holiday gift giving. Everyone raved about how good they were! Will definitely use this recipe again! Very bland. Maybe canned milk and more spices would help.